Dear Zindagi is expected to be hit by Befikre release in its third week but it should still do better than Kahaani 2. Second Saturday to Second Sunday saw a growth in collections by another 20-30%. Second Weekend collections of Dear Zindagi are 10 Crores which is pretty good with Shahrukh Khan pushing the movie. Both Kahaani 2 and Dear Zindagi are performing in similar markets of South and West Bengal so both the movie are effecting each other with Kahaani 2 facing more issues as it is a new release. Dear Zindagi is made on a budget of 45 Crores all inclusive. Shahrukh Khan who is the producer has not taken his salary to keep the costs down. Shahrukh Khan salary is usually in the range of 50 Crores. Dear Zindagi is releasing on approx 800 theaters and 1200 screens across India and 600 screens in overseas. This is in keeping with niche nature of the movie and is one of the smallest release for a Shahrukh Khan movie. 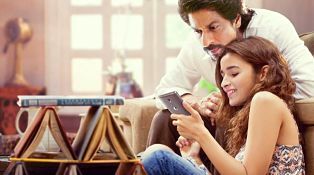 Dear Zindagi has its all India rights sold to NH studios for 32 Crores it needs to collect 65 Crores to be called a hit and cover its ALL India rights. Producers are already having a table profit having sold India theatrical to NH studios, Overseas to Reliance and satellite rights at a good price.